Whenever Wasamin announces she will be appearing at NHK Hall on one of NHK’s various music shows, I always do my best to score a ticket, or at the very least find someone who is looking for someone to go with. So when Wasamin mentioned she would be on this episode of Utacon, I immediately scoured the usual sites for a ticket, only finding tickets for the previous week’s show, which featured Nogizaka 46. Checking again a few days later I found a bunch of tickets had been made available ranging in price from 1400-3000 yen. However, by the time I could get some time to go buy one almost all of them were gone, save one. 3000 yen later, I had my ticket. So I was pretty much resigned to the fact I would be seeing this show solo. But as I was on my way to Shibuya I got a random message from a Sayanee fan; “Is the ticket still available? I would love to see Sayanee!” I said as long as he could make it to NHK Hall in the next 45 minutes, he could have the ticket. So cool. In the meantime, I received another message around 30-minutes before doors opened from one of my Wasafan buddies asking if the ticket was still available. Great, everyone waits until the last minute. Unfortunately they were a little too late. I met my new friend at the entrance, and we immediately queued up for the show. 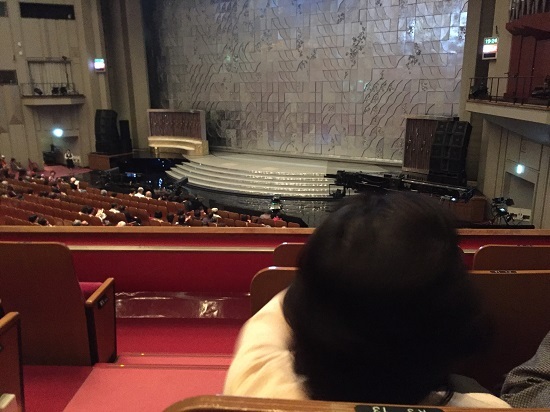 The seating assignments at the NHK television shows is done by random chance, so no matter where you are in the queue you have an equal chance of getting a great seat, or a not so good seat. In fact, the best seat I ever had for one of these shows I got being one of the last people to enter the venue, and the worst seat being when I arrived three hours early. So you never know. This was my 5th time seeing an NHK Show at NHK Hall (I saw SDN48’s Graduation Concert, and Nagara Group Enka Matsuri here as well) and in the previous four shows I have won floor level twice and 3rd floor twice. What kind of seat would we get this time? I had my friend choose which ticket lane we should go in, and he picked the far right lane. We ended up with a 2nd floor seat. However, it was in the 4th row on the right side. If you have ever seen the way the balconies are set up at this venue, the left and right side of the 2nd floor jets out over the floor seats very close to the stage. So having a 4th row seat on the side balcony is actually pretty close to the stage. So ultimately not a bad seat at all. 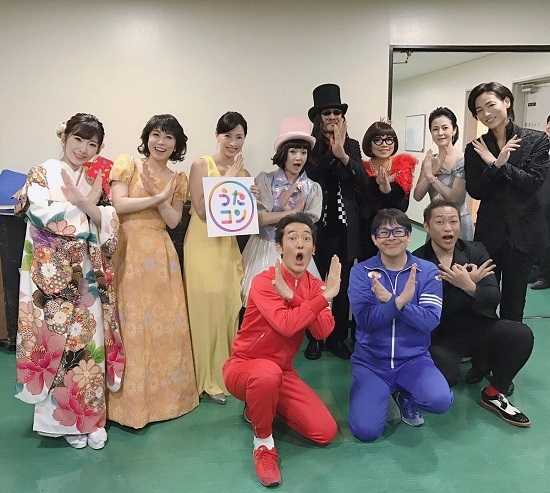 Although when we met up with the various Wasafans also in attendance it seemed most of them got 1st floor seats, two of them (Kimura-san and Caster) getting front row! and your hosts, Tanihara Shosuke and Kogo Tomoko. Mizumori/Wasamin/Sayanee Trio: Wasamin had to be in heaven with this lineup. She thinks of Kaotan as her big sister, and we all know she has a crush on Sayanee. Of course Wasamin was admittedly a bit nervous, and was focused more on her singing than who she was singing with. Either way, it was a dream lineup, especially for Wasamin! Tetsu and Tomo: I guess it’s time for me to again mention that I am not much of a fan of Japanese comedy, it is way too “slapstick-styled” for my taste. Every Japanese comedian to me is either like Abbott and Costello, or Carrot Top. But I digress. Tetsu was repeatedly making this weird hand-gesture I guess is he famous for throughout the show. I was thinking “Dude, enough, you are annoying!” That said, the comedy song, which features their catchphrase “Nande darou, nande darou” was cute. I am pretty sure I have seen them do it before on another variety show. Hanawa: I point this guy out because his was the song we had to be taught a specific reaction for the show. Interestingly, the performer before him, Akikawa Masafumi, performed with the stage filled with effects from a fog-making machine, so Hanawa performed on the floor in front of the first row with the audience as a backdrop, and during the chorus the entire audience pumped their fists in unison, which is what we practiced before the show. The funniest thing though was watching the massive team of staff mopping up all the water on the stage from the effects of the fog during this performance. ANGERME: During the show they only did a brief cover of a Matsuura Aya song, but after the show ended they came back on and performed their new single; Koi wa Acha Acha is really good. In fact I think I will pick up a copy this weekend. Sakamoto Fuyumi: I was going to call her the “older” Enka singer, then I looked her up on Wikipedia to find out she’s only eight months older than me. Sheesh! 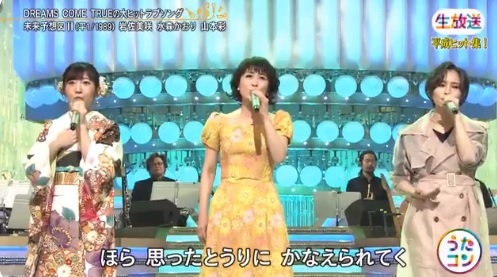 Anyway, most Enka singers look older when they pull their hair back like that. Her singing is top notch though, and she had interpretive back dancers behind her, which made the performance all the more interesting. 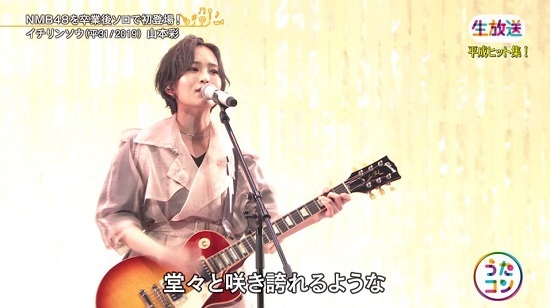 Sayanee: She was definitely the highlight of the show, getting three performances. In addition to the show open, and the trip with Kaotan and Wasamin, she came back toward the end to perform her new single, Great song, and a great night overall for her. 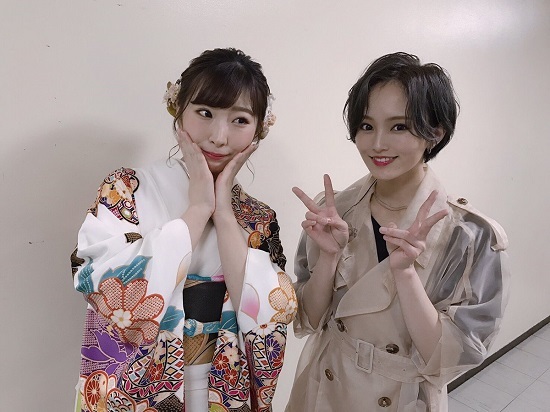 Wasamin: Let’s see, she got to sing with Sayanee, she closed the show with Koi no Owari Sangenjaya, and even was the focus of one emcee, which became all sorts of awkward when she got a bit tongue-tied and Mizumori-san began interjecting into the interview. It was funny though. Wasamin did a great job! Anyway, those were the performance highlights for me. Of course it is always interesting watching how they produce a live television show, and how different it looks than from what you see on TV. There is as much, if not more action going on off-camera than there is on-camera. Also, when they do the interview portion of the show, it seems like they are talking in a fully bright room. However, the interview area is actually the only lit portion of the room, everything else is in total darkness. After the television show ends, there is around 20 more minutes of “Show” for the live audience where certain performers who didn’t get to make a solo appearance have a chance to perform. This is where ANGERME sang their new song, as well as Yamauchi Keisuke, who seemed to have a big following in the room. When he took the stage a mass of red glowsticks lit up throughout the audience. Once the show ended everyone makes a mad dash toward the exit. I was attempting to take off my Wasamin Happi coat and accidentally smashed a woman in the side of the head with my elbow. I don’t know why people are desperate to get out quickly, they were pushing me from every direction. Undaunted, I removed my coat and put it away before leaving the venue and heading back to the train station. Checking Wasamin’s schedule, she is performing in Okinawa this weekend, at an onsen next week, and then the following weekend she has mini-live events in Saitama and Yokohama. The Yokohama event conflicts with an AKB48 handshake event I have tickets for, and the Saitama event is the same day as Sasshi’s grad concert, as well as a Minyo Girls one-man live I have tickets for. However, providing I don’t go to Sasshi’s concert, I can still make it to Wasamin’s second performance that day. Wasamin is spending much of May outside Tokyo doing her play with Mizumori Kaori, so I may not be able to see her for a little while.